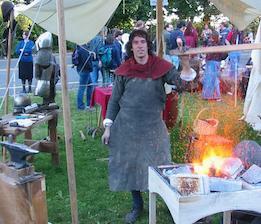 Jeffrey Wasson mans a portable forge, demonstrating the art of armor making at a living history exhibition. Serious scholars of history might once have scoffed at the notion of undertaking an arts and crafts project as a means of historical study. In recent years, however, dedicated efforts into living history and immersive historical experimentation have proved that bringing history to life can, in fact, achieve a different sort of understanding to research and data taken from artwork, chronicles, and written records. Experimental historians have, of late, worked at redacting historical recipes with heritage food items, reproducing scientific discoveries using period instruments and methods and – perhaps some of the most celebrated – recreating or rebuilding military hardware using historically accurate materials and production methods. If any of those endeavors sounds particularly interesting to you, then you are probably familiar with several episodes of the PBS series Nova, in which filmmakers have documented projects to reproduce military weaponry in Secrets of the Viking Sword, and Secrets of the Samurai Sword, and the episode in the series Secrets of Lost Empires in which two crews assembled a pair of full-size, functional medieval trebuchets on the shores of Loch Ness in Scotland. And now, Nova is turning this same sort of focus on another aspect of high-tech historical craftsmanship in their new episode titled Secrets of the Shining Knight. In it, a team of experts will attempt to replicate a well-known harness originally crafted in the 16th century in England’s renowned, state-of-the-art Greenwich Armory, putting their knowledge and skill to use to replicate both the construction and function of the original piece. But as fascinating as exploring the fine points of Renaissance metallurgy and forging skills might be, this project is hardly limited to uncovering the facts about engineering, design, and craftsmanship. Like products from specialty makers today, things like architectural monuments and military achievements (like swords and armor) have a great deal to tell us about the culture surrounding them. What were the aesthetics, the values, and the principles of the people who crafted and admired such items? 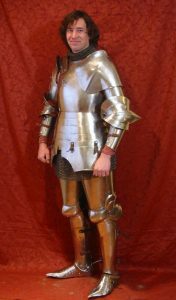 What can studying and replicating a piece of armor from history tell us about the 16th century understanding of the values of chivalry? (A very complex and even contentious topic, even in the days of Tudor England.) And what can it tell us about our own perceptions – and misperceptions – about the knightly code today? Jeffrey Wasson wearing the product of his craft. Jeffrey Wasson is founder and chief craftsman at Wasson Artistry, and he is unarguably one of the finest American armor-makers working today. He has crafted museum-grade replica armor for jousters and historical combat and military experts all over the US and Europe, and his work has even been featured prominently in the 2004 Neiman Marcus Christmas catalog, which offered a custom harness for customers to bedeck their own “lord a-leaping” in Gothic plate armor for the mere cost of $20,000. When Nova needed an expert platener (that is, a specialty plate armor maker) to head up the reproduction project for Secrets of the Shining Knight, they turned to Mr. Wasson who, working with metalsmith Ric Furrer, took on the job of studying and reproducing this remarkable historical artifact. Jeffrey Wasson joins podcast host Scott Farrell for a conversation about his work on the upcoming Nova episode, and what it might help us discover about the culture of knighthood and the code of chivalry. Learn more about Jeffrey Wasson’s armor reproduction work at his website Wasson Artistry.